Wow. I can’t even fully describe the sweet/saucy/crunchy zing that invades your mouth during your first bite. It’s like Mexican Food with some sass. I’m stumped…………you just have to try it to understand it. Combine all but slaw in a mini food processor or chop and combine yourself. Mix desired amount of dressing with slaw mix no more than 30 minutes before serving. Combine all ingredients into your crockpot and cook on low overnight or until meat is tender. And thanks Summer. You made our Monday night dinner, perfect. Yum! Oh my gosh, it’s only 9 am and you have got my mouth watering! I’m going to have to try this one! Thanks for your fun ideas! I love checking them out every day! These sound absolutely delish! Can’t wait to try these out. That looks really good, I can’t wait to try it. I’ve got some frozen shredded pork in my freezer and I’ve been looking for a good sauce for it, this will be perfect!!! Thanks! I love your crafts, I have a list of ones I want to make, they all look so fun. I’m so glad everyone’s enjoying everything. Oh, and Jenni, where did you grow up? I grew up in Southern AZ and so I LOVE authentic Mexican food. Mmmmmm….. I made this for dinner last night. My husband LOVED it. Reminded him of the mexican food he got in California. He said it was the best meal he’d had. Thank you so much. I had my aunt and cousin over for dinner tonight and made this recipe. It was easy and delicious! It was funny because my cousin said she had this recipe saved from your blog and wanted to make it sometime. 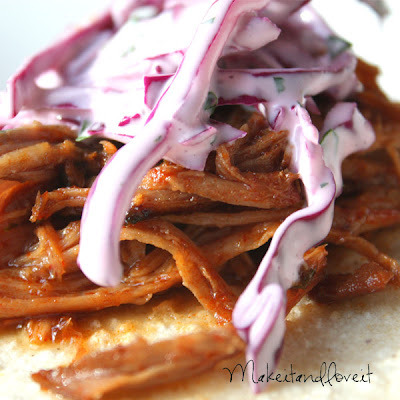 The slaw goes perfect with the sweet pork. I will definitely be making this again. Thanks so much for sharing! I’m going to make this tomorrow… I am so excited! It sounds delicious. I keep checking back to see these so I figured it was time to make them now. I’m sure they will be yummy! Thanks! Thanks for sharing this wonderful recipe. I made them yesterday and they were as delicious as advertised! I posted the recipe on my blog and linked back to you :) Also, thanks to Summer…what a great recipe! I have made these several times and LOVE them. The kicker is the slaw it just makes the dish. Thank you so much. Ashley, I too grew up in southern Arizona, Safford. Where did you grow up? I make the meat mixture almost identical in the cafe rio sweet pork and so one night we have cafe rio sweet pork enchiladas with the cilantro lime rice and then the next night we use the left over pork and i make these tacos with the left over rice as a side! YUMMY!!!!! 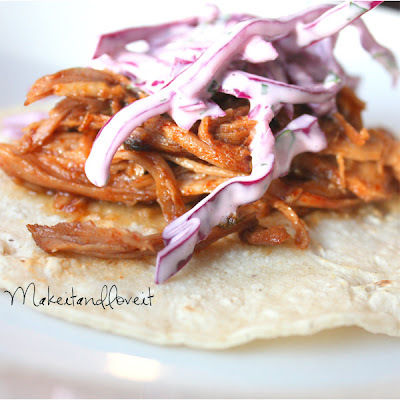 Are you willing to share the recipe for the cafe rio sweet pork??? Hi! I'm here through Our best bites. If you look at my food blog, you'll find that I'm addicted to cilantro. This looks fantastic and I have to go to the store right now! I have red cabbage in my fridge waiting for the perfect recipe- found it! I love cilantro in 'slaw. What is the purpose of Dr. Pepper. Can you leave it out, or what about caffeine free DP? Lisa- the Dr. Pepper acts as a meat tenderizer. I use Pepsi or Coke for a slow cooked Teriyaki Chicken. I promise, there is nothing wrong with a caffenated Dr. Pepper when cooking meat. Way to go Summer! You are way awesome! p.s. if you want a killer roasted chicken recipe Summer is the girl to call. If you'd like to cook the pork in the oven plan on around 45 minutes per pound at 325 for a bone-in pork shoulder roast. I take the pork shoulder and sprinkle it with a generous amount of salt and pepper, wrap it in foil, place it in my trusty cast iron skillet and walk away until the meat is tender and the bone falls out easily. Make the sauce on the stove top and reduce until the desire thickness. Combine and freeze any extra. Just curious about your sauce… you mention a can of Dr. Pepper but then put 20 oz. Do you mean a bottle or do you mean 12 oz? This looks so similar to the fried wonton ones at Applebees. I love those so I'm sure I'll love these too. Thanks for sharing. Yummmmmmmmmmmmm, out comes the pork and I am making this on the weekend. Hubby and I do a version of atkins called sugarbusters. So I can use diet Dr. Pepper but what about the brown sugar? Would plain splenda work, do you think? I have the brown sugar blend from splenda but it still has a lot of sugar when talking about 1.5 C's. So would just plain old regular splenda work? The rest is on our diet! yeah! Love your recipes. I made this for dinner recently and must say it was one of the BEST dinners I have made in a while. I even hid the leftovers in the back of the refrigerator so no one else would eat them!! Thank you for this recipe- I can’t wait to make it again! I just wanted to say thanks for this recipe. I’ve been making it for a couple of years now and it never disappoints. My go to recipe for lazy Sundays and potlucks. Thanks! These are now a family favorite! And it feeds an army!! Made the coleslaw today to go with a different recipe for pulled pork tacos. Was an absolute hit with everyone!